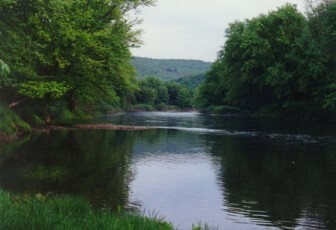 The Susquehanna River is a river that flows from southeastern New York state through central Pennsylvania. 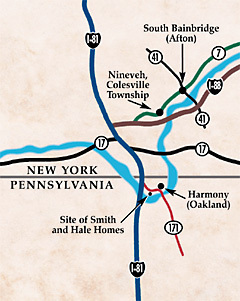 At a point where the river briefly dips into Pennsylvania, some key events in the history of The Church of Jesus Christ of Latter-day Saints took place (near Harmony, Pennsylvania). To avoid the persecutions at his home in Palmyra, New York, in 1829, Joseph Smith took his wife Emma to live in Harmony, where she was from. While there, Joseph and Oliver Cowdery continued the work of translating the golden plates. On May 15 of that year, while Joseph and Oliver were translating, they came upon a scriptural passage regarding baptism. Wanting to know the Lord's will on the subject, they went to the banks of the river to pray to the Lord. While there, John the Baptist, as a resurrected being, appeared to them and conferred upon them the Aaronic Priesthood. They then entered the river and baptized each other. Some time later, three other resurrected beings appeared—Peter, James, and John appeared on the banks of the river and conferred upon them the Melchizedek Priesthood. This page was last edited on 8 September 2010, at 01:50.